If you cannot live your life smoothly without music, you need to invest a few more bucks to get the best quality sound at home every time you play your favorite tunes. You won’t believe the difference a subwoofer can make when you add one to your existing sound system. Not only the low notes will get a boost, but also the clarity and richness of the sound will increase in multifold. Forget about enjoying music, it will make the sound quality of the movie real and immersive. You will get the same feeling of watching a movie in a movie hall at your home. The dialogs, action scenes, and background music will be crystal clear and vivid. 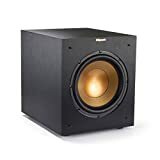 Before you buy a subwoofer to enhance your sound system, you need to watch out for a few parameters like size, power, connectivity, design, and of course price. To make things easy for you, we have listed the top 11 best home audio subwoofer in 2019. You can choose any of these home audio subwoofers as per your requirement and choice and get value for your money. It is an 8-inch throw subwoofer with a power capacity of 100 watts. It is quite powerful for its price point, and the matte black ash design is one of its selling points. You can control the amplification and control bass at any volume. It produces lower frequency than the traditional subwoofers you get in the market which is a plus point. The best part is the subwoofer handles the crossover and adjustments in different phases of music smoothly. 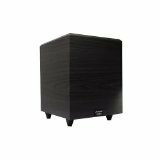 It is an affordable subwoofer with low distortion and accurate bass tonality and provides power and depth for the low ends of any audio. It weighs only 20 pounds, and the installation is very easy. This is one of a kind subwoofer with amazing sound quality and unique design. It has high efficiency and 8-inch front-firing throw. The peak capacity is 250 watts, and it comes with auto shut-off feature. It is specially designed for those customers who want to experience powerful, high-octane bass at their home. If you are into movies and rock and rap songs, this is tailor-made for you. Bose is one of the leaders in the audio devices, and its sound quality is considered to be the best by most of the users. This one is a powerful wireless home audio subwoofer with 300 output power. It is specialized for providing dramatic bass for best auditory experience while listening to music, watching TV or movies. The glossy top design is elegant, and it eliminates the noises and distortion easily. You can connect to the device with Wi-Fi or Bluetooth. 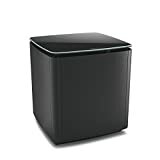 It is a medium-sized subwoofer with a power capacity of 100 watts. It is a downward firing subwoofer which gives crystal clear sound and powerful bass. The design will go down well with traditional black sound boxes around it. One can classify it under heavy-duty subwoofer, and the front-firing has a very long throw of 10 inch. There are various modes available as with most of the standard subwoofers. It is perfect for small to medium-sized rooms. Sony is one of the big names when it comes to the audio industry. This one is a very powerful subwoofer for the home that will enhance your auditory experience like never before. It has a 10-inch throw and is perfect from small to mid-sized room. Its overall performance is great and boosts both low and high notes. The chest thumping bass is extremely vivid and will complement your home audio system seamlessly. This is a highly efficient amplifier with options to control bass and comes with various filters. It is an all-rounder and a perfect choice for in-wall or in-ceiling home theater. It also works great for multiple room system and surrounding sound system. The sound quality is deep, clean and accurate. It is also very durable and made up of resonance-free material. This is a very budget-friendly subwoofer, and it produces powerful, punchy sound. Hence, it is best for those who prefer it more for watching action and horror movies as well as rock and rap songs. It may not be that good for low notes. It has a 10-inch long throw, and the cone shape helps it to produce louder sound and least noise. It is certainly a value buy if you can comprise with normal low notes. It is a very performance subwoofer with an 8-inch throw and sensitive of 86dB. 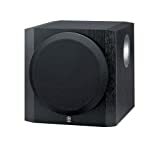 It is perfect for mid-sized rooms and for those who want chest thumping sound. Its power capacity is 600W at its peak, and the bass is deep, and the sound quality is of high class and accurate. The design is of cone structure which helps it to produce louder and deeper sound than others. It comes with various filters to shuffle with. 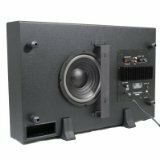 This is a perfect subwoofer if you want to enjoy movies just like that way you do in a theater. The sound clarity is extremely good, and the background music is thrown powerful, and you will get that punchy effect for action and horror movies. The Venturi vent present in the subwoofer is specially designed to cancel all the surrounding noise even at high volumes. It has a 12-inch long throw, and it comes with 5-year warranty. You can classify it under very powerful subwoofer as its peak power capacity is 475 watts. It is a 12-inch long throw subwoofer with wood veneer finish and better sound quality than most of the subwoofers on the list. It is suitable for you if you have a large room and have a big budget. It will get your room rocking, and the beat will create vibration in your heart just like the way party people like it to be. The clarity of sound and all the different notes is beyond comparison. It is deep, loud and clear and the power capacity is 300 watts. It also takes care of smooth blending with the speakers and reduces all the turbulence and noise. It powers down after 15 minutes of inactivity to save energy consumption. It is a 10-inch front-firing wireless subwoofer with a brushed black vinyl design in the exterior. It is popular for its low crossover and phase control which makes the sound produced smooth. It can be placed anywhere in the room to get immersive audio and hence, you can even hide it with home decors. It is exceptionally lightweight with low-frequency output and minimal distortion. The true-to-source amplification is what makes it the best home audio subwoofer in 2019. It has managed to grab all the attention within a few months of its launch. If your budget is slightly on the higher side, go for it at once. You have to choose the one that satisfies your requirements and budget. 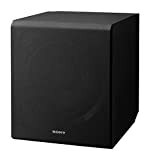 You require a different subwoofer for a large room or for sound to reach to multiple adjacent rooms clearly than the one you will require for a medium-sized room. Therefore, make your choice wisely after considering all the parameters, and you can blindly choose your subwoofer from the above-mentioned top 11 best home audio woofers in 2019.